Festivals define this land of diversities and the word ‘diversity’ enters the gamut of festivals as well. We Indians define unity in diversity and the festivals show diversity in unity because celebrations bind us all. The wide array of variety you get to see in them is what sets the country apart from the rest of the world. 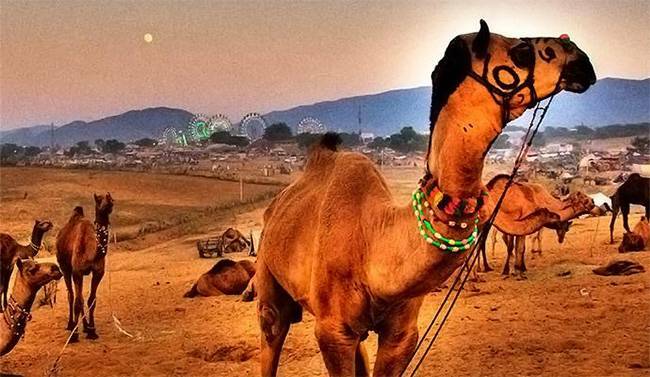 The Pushkar Camel Fair in the west to Durga Puja in the east, Kila Raipur in the north to Alleppy Boat race in the south, the differences and the similarities are mind-blowing; the colours are breath taking and the eager wait for the ocassion to arrive next year is heart-rending. That is India, the land of dazzling festivals. Colour colour everywhere and not a moment bland! That is Kisama’s Hornbill Festival in Nagaland. It’s a time when tradition meets commerce and tourism, and the result is boundless joy and endless pride on the part of us Indians who’ve managed to thoroughly preserve ancient cultures in full glory. 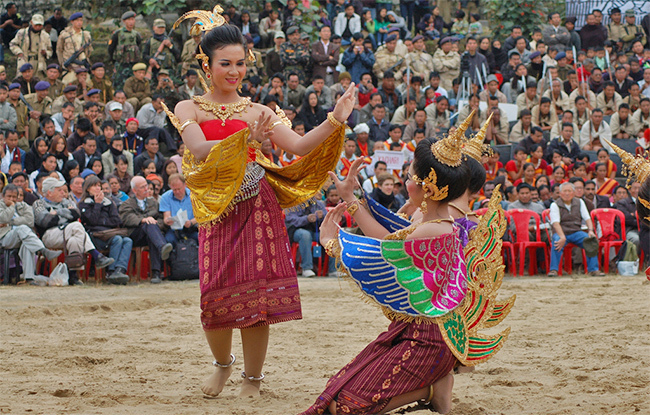 Nagaland, the state of 16 major tribes is a land of diversities and all the tribes participate in the festival! So diverse! Well, that is India! Each tribe is unique so can you imagine the dazzle when they all come together for a week-long festival within a single premise? It’s like seeing a most spectacular rocket bursting into 20 colours all at once. The festival is organized by the Government of Nagaland at Kisama’s Heritage Village in order to showcase the state’s varied and diverse culture. There are separate morungs for every tribe where the folks sing, dance and eat in a way typical to their people. The activities held are an assortment of folk music, dance, mock wars, naga styled wrestling, traditional parades, regional games, craft-sales etc. The list goes on and on. Just drink zutho rice beer and let Nagaland sink in. In memorium of the Battle of Kohima, there’s the war memorial museum that will take you back in time. The bamboo pavilion will make your head reel with all the exquisite handicrafts it has to offer. The food is scrumptious and for the food connoisseurs, it’s like an experiment paradise given the unusual tastes of the Nagas. With night fall, ‘modern-day’ takes over with a snazzy rock concert. Book launches by the local authors are a part of the attraction. The festival was prolonged beyond a week in 2013. It’s hard to let go of the good things in life and this is really really great. When: Hornbill Festival is usually held every year from December 1-10. Where: At Naga Heritage Village, Kisama about 12 km from Kohima. Events start at 9 a.m. everyday. ‘A healthy mind & a healthy body’, that’s the motto of just about the wackiest sports fiesta of the country. The people of Punjab, they say, are very physically driven. Those who doubt it are most welcome to pay a visit to Kila Raipur near Ludhiana on 31st January and leave on the 3rd of February. However, I warn them that when they leave, their heads might spin a bit because you cannot leave with a perfectly normal state of mind after you have witnesses this sports extravaganza! It’s crazy, its cut-throat, it’s mind-blowing…it’s totally fantastic. More than 4000 men and women take part in the wide range of events organized. They include just about every kind of daring imaginable. Starting from dogs to camels to bullocks, no one is deprived of the chance to race. Rural sports like wrestling, tug of war, kabaddi, weight lifting, volleyball, handball and horse races are the more conventional ones but it all becomes quite quirky when you see activities like handling tractor trollies, sit-ups, stone cracking on chest, tractor pushing with legs. For stuntmen with extraordinary mettle and pluck, this is the land of the free. You can see men picking up three bicycles with one’s teeth and riding two horses at once. People here, literally play with fire. 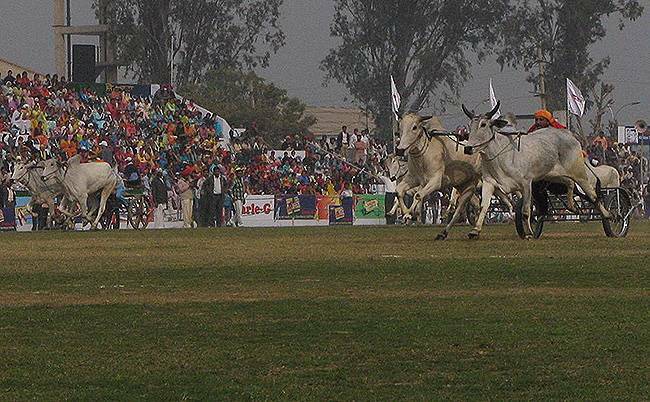 The biggest attraction is the bullock race that awards lakhs of rupees for prize money. The event was started decades back in the 1930s by a philanthropist named Inder Singh Grewal to provide the hard working and talented men of the region with a platform to present their skill and bravery. It only developed over the years. Sportsmen have only one religion and that is endurance and passion. This is the place you can see that in person. Where: Kila Raipur (15 KMs from Ludhiana), Punjab. This is like something a very fanciful child reading lots of fairy tales and adventure stories would probably imagine if he lets the mind go running. Held at Punnamada Lake, it’s a magnificent contest where the sport presented cannot be won by individual skill. The boat race is a team-game. 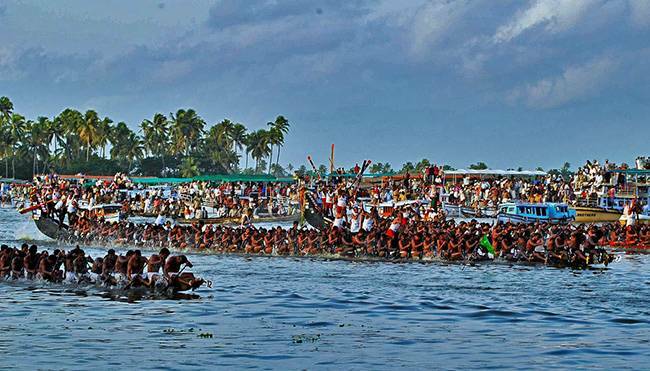 The chundan vallams or snake boats can hold a hundred rowers all at once and the game is the victory of synchronization, team spirit and a common brotherhood that binds all the rowers. The rowers in a boat are from different families and backgrounds but when in a game, they have just one family, that of their team mates. The race is conducted on the second Saturday of August and Alapuzzha experiences a deluge of tourists who come to see astounding boat races. Prime-minister Nehru, in the year 1952, on his visit to Alapuzzha was so impressed by the grandeur of the races that he awarded a trophy to the winners. This became a practice and has continued ever since. Other kinds of boats also participate in the event like the irutthukuthy designed for speed and nocturnal journeys, vaipu designed for battles on water and the circular churulan besides others but like in a dance troop where the lead dancer grabs the maximum attention, the snake boats are generally the ones that receive the most limelight. Gorgeously draped in silk and a medley of colours, these boats are a treat to the eyes but the beauty lies in the uniformity that is constant. The way the oars move, the concentration of the participating men, the expression on their faces, the bated breath of all the club owners….it’s the same. This ‘sameness’ is what binds the rivals as well. This event will leave you gaping. Where: Punnamda Lake, Alleppey, Kerala. Swanky! That’s what the sunburn festival is. Held at the Candolim Beach in Goa, it is a most popular electronic music festival that spans a period of about 3 days. 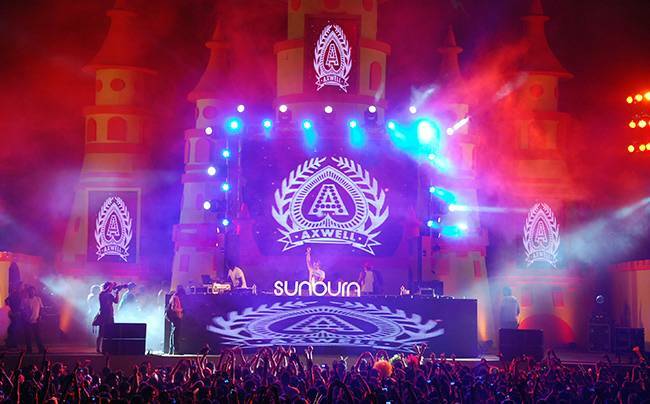 It started in the year 2007 when Percept’s Shailendra Singh joined hands with India’s coolest and most popular youth icon Nikhil Chinapa who was the Festival director of Sunburn. It is a platform for some of the biggest names in the musical scene in India and even the world. DJs to rock -bands, this is the place for a music lover’s nirvana. It has hosted some of the biggest names like Carl Cox, Above & Beyond, Axwell, Simon Dunmore, Shapeshifters, Sander Van Doorn, Ferry Corsten, Afrojack, Goldfish, Laura Jansen, Richard Bedford…the list will go on if I don’t stop right away! With its volleyball courts, flea markets, arrangements for rock climbing, Slippery football, Spa treatments and juggling shows, you could be any kind of person and there would be something or the other in store for you apart from the exuberant music and dance. There are multiple stages for the various kinds of music presented like in 2008, stage ‘banyan tree’ was made for trance acts while house music was performed on the ‘circus stage’. In 2009, the night-long ‘After Dark’ parties were started. You could also escape the music buzz for some time and take in the fresh air of the Arabian Sea. The audience has progressively increased over the years. It started is nearing a lakh now. They have even introduced camping arrangements now. It’s a perfect thing to plan for when you want to create a memory benchmark with friends. An experience as wicked good as this cannot be forgotten so easily. 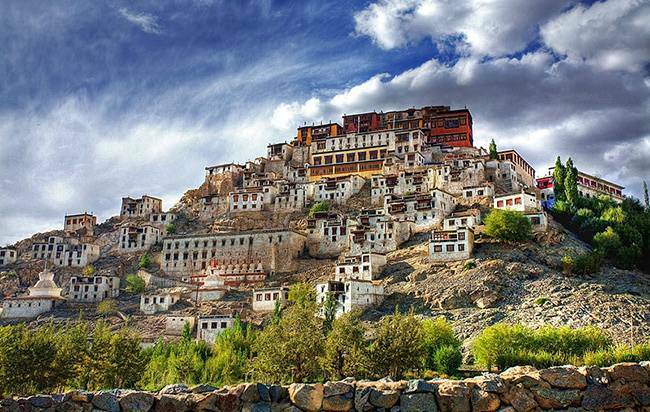 Ladakh, the land of mountain deserts flood with the most vibrant hues around 7th July when the Hemis Festival is celebrated in the honour of Guru Rinpoche’s birth-day. The fiesta venue is the popular Hemis Gompa. It’s preparations are headed by the head lama of the monastery. There’s a fabulous fair held here. It will make anybody feel like a child with all the colours around with food to it and things to buy. Remember those trips to the fair when you’d irritate the life out of your parents asking them to buy toys for you. Well, here’s your big chance traveller. The star of the festival is the exotic mask dance performed around the flagpole in the Hemis monastery’s courtyard. Like all forms of art, it communicates a quaint message – that of evil’s defeat. The depictions of the black-hatted evil wizard Trakpo, the mean Ruta demons and Yamraj will leave you breathless. Guru Padmasambhav or Rinpoche was a messiah born to redeem mankind and these performances are a subtle reminder to people to take the initiative of carry forward the guru’s torch. Let us know if the music and the ‘Cham’ dance does not make you want to clap hard and jump up and down with glee. Coming to the instruments….now that’s a different ballgame altogether. They are more than mind-blowing! The pulsating beats of the drums, the rhythm of the cymbals and the sonorous tune of the astonishingly long horns and trumpets will make your heads reel and transport you to Shangri-La. Every 12 years there’s a stunning exhibition of the ‘Thanka’ that portrays Rinpoche. It’s an enormous loss if you miss it. Teemed with the local delicacies and other attractions like yak and camel safaris, this is one experience worth having at least once in a life-time. Where: Hemis Monastery, 45 kilometers from Leh. Get set Go animal lovers. This is what you have been waiting for. This unique fair is held in November during Karthik Purnima. It’s an important live-stock trade fair where cattle farmers come together each year to showcase, sell and buy animals. The number of camels present here each year is staggering. 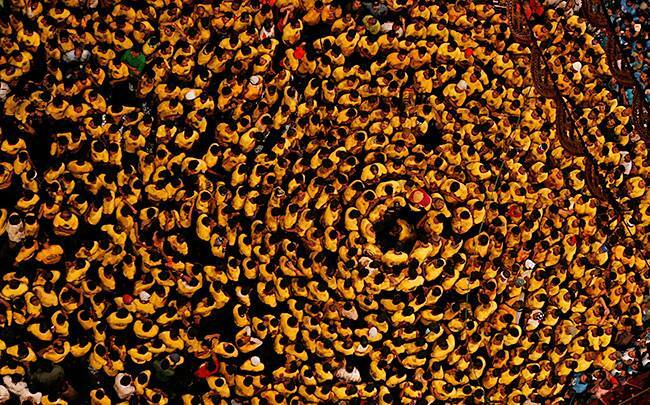 The number can be anywhere between 11000 and 50000. 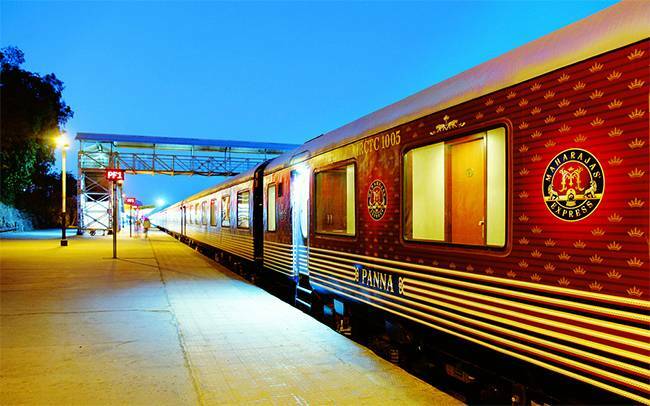 Today, it has grown in stature into one of the chief attractions of incredible India. There is a whole array of friendly contests like the longest moustache, best bride and breaking the matka. It’s a madhouse for women with a fetish for fabrics and ornaments. The stalls are sparkling. The fair begins with a fun-filled camel race. Numerous men and women take a dip in the Pushkar Lake. It’s said to erase one’s sins. An occasion in Rajasthan is never complete without some folk dance and music. This fair is no exception. The local artists form a beautiful part of the whole affair. It is very interesting to see the camels all done up with attractive accessories. One gets to see these gorgeous beasts in full glory when they do all sorts of things like parade like models on a ramp, race and even dance! Oh, the beauties! The carousal doesn’t end here. There are magicians, snake-charmers, stunts-men and acrobats among various other performers. You are most welcome to collect souvenirs from the crafts bazaar so that when you are old and senile, you remember what fun you had at the fair. Nowadays, tourists can even witness the carnival from an air balloon up in the sky. A most interesting activity incorporated recently is the cricket match played between foreign tourists and members of the Pushkar Club. It’s really amusing. Do attend this fair because it’s unforgettable! Where: Pushkar near Ajmer, Rajasthan. Vibrant, so vibrant! Vibrant Vrindavan could probabaly be one of the 7 wonders of the world….if only the 7 man-made wonders did not have to be architectural delights! 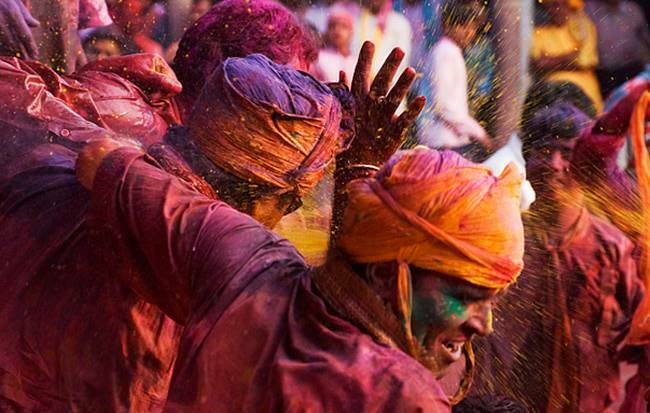 Once you have seen Holi in Vrindavan, your life can never be dull. It’s just impossible because all you’d have to do in moments of suspect dullness is close your eyes and imagine what you saw in Vrindavan, the land of Krishna. Like I said, it’s difficult to let go of the good things in life, which is why holi is prolonged here for one solid week where it’s supposed to end in just a day. It’s a most colourful bash where people of every age become 10 year olds. It is but inevitable at a time when Krishna becomes a co-participant in the fun. Some of the greatest parties (the word seems perfect in spirit) at the Bakai-Bihari temple and the Gulal Kund of Braj. At the former, Banku-Bihari ji, that is, Lord Krishna is dressed in white and brought in close proximity to the devotees while the priests sprinkle coloured water on the devotees. That must be so much fun! Sprinkling water on people who won’t try to save themselves. Ideal! Isn’t it? The devotional numbers sung and played in the background are just like trance music. It does something to the human mind and makes everyone embrace the moment At gulal kund near the Govardhan hill, it’s a different kind of fiesta. There are enactments of Krishna leela that simply unforgettable. If you want to ‘see’ the true meaning of ‘colourful’, you just have to visit Vrindavan during Holi but I warn you travellers, everything else will seem bland once you’ve visited the splashy city during the festival of colours. Where: Vrindavan near Mathura, Uttar Pradesh. It’s glittering! 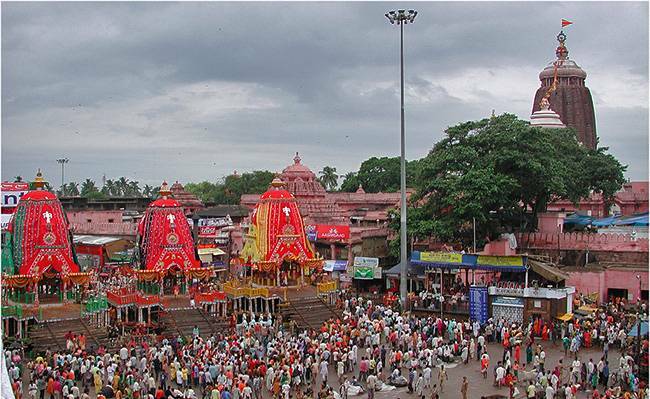 This historical city glitters during the grand festival of Dussera. Dussera generally refers to a particular day in the devi paksh, that of Durga-Dashami but the Mysore dussera lasts for 10 days. 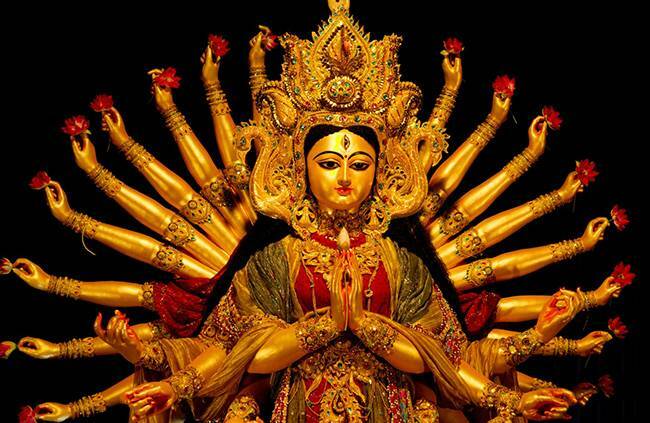 It is celebrated to commemorate the goddess’s victory over the Mahishasur, the bull-demon. It generally falls in October, and sometimes September. 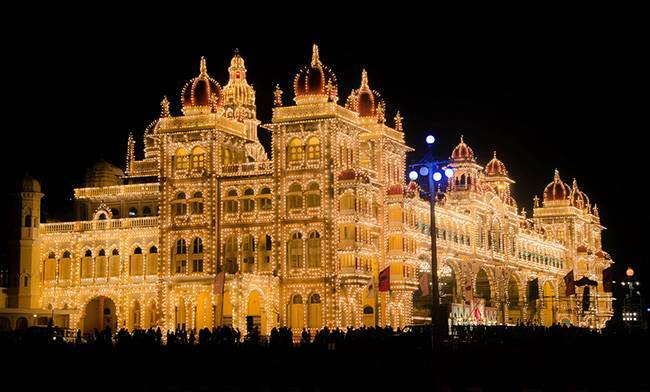 The Mysore Palace is the chief attraction with its dazzling illumination. It’s impossible to count the number of light bulbs put up though you can always try to count. The number is supposedly a lakh. The Karnataka Exhibition Authority organizes a beautiful exhibition on the palace grounds. You can buy anything you want starting from handicrafts to traditional clothes. Kids to get to have their own share of fun games arranged for besides various amusement rides. The party does not end here. There’s a film festival, kite festival, flower show, kite festival and a food fiesta. However, the show stealer would be the Jumbo savari where the golden idol of goddess Chamundeshwari is paraded seated atop a most opulently decorated elephant. The carnival includes dance, music, multi-hued tableaux and other animals like handsome horses and svelte camels. After this, there’s a torchlight parade conducted on the Bannimandap grounds. This festival has been celebrated on a grand scale right since the medieval years and the tradition has been continued dynasty after dynasty. The royal sword is still worshipped on Durga-Navami. It is also a part of an organized procession full of pomp and colour. Lastly, I must mention the wrestling bout or kusti spardhe which has participants and spectators from all over the country. Upon my word, it’s very entertaining! If you want to taste the true flavours of Karnataka, this event is a must see. It’s simply gorgeous. It’s party time. The eighth day of Krishna-Paksh is a gala affair in ‘aamchi Mumbai’. Gokulashtami or Janmashthami will leave you thirsting for more. Its Dahi Handi here. This custom takes after Krishna’s adventures with his friends where they indulged in much mischief making to get their hands on the yummy butter milk. Here human pyramids are made for breaking handis just like our beloved Krishna did. The participants are called Govind pathaks. Groups compete for the prize money. It’s so excessively cool when you see it in person. The adrenaline rush, the mounting tension, the held breath and the final exhalation of relief is just out of the world. There is a joint exhilaration of victory, collective sighs of defeat when pyramids collapse, collective resolutions for the next year and consolidated joy of the festival. For once, no matter which part of the nation you are from, everybody is on the same boat rowing together towards a common goal. Some of the most favoured and noted contest grounds are Mazgaon, Worli, Lalbag, Thane, Lower Parel and Dadar. It’s grand at the ISKCON temple complex in Juhu. There are cash prizes offered at about 4000 places in Mumbai. This is one event which you must see if only to feel the rush and Krishna’s presence right by your side. If you want to see what ‘grand’ actually means, you are supposed to come to Puri exactly on the second day of Shukla Paksh in the month of Ashar. Going to visit an aunt is generally never a dull affair and it is no different for Lord Jagannath and his beloved brother and sister, Shri Balaram and Shri Jagannath. The deities go on a visit to the Gundicha temple and halt there for all of 9 days. On this day, the deities come close to everybody because in the midst of everybody, irrespective of caste or creed is where the Gods belong. Foreigners and non-Hindus, everybody is free to see the deities and pull the magnificent chariots seated upon which, the Gods travel. Lord Jagannath, Balarama and Subhadra spend some time at the Mausi Ma temple where they are plied with the popular Oriya delicacy of poda-pittha. They say one glance of the chariot is potent enough to bless the soul for a long long time. This might sound absurd to many but not to those who have seen the chariots with their own eyes. They are so magnificent that the soul is bound to feel eternally blessed. The mere touch of any part of the chariot is said to be very holy. They are recast every year for this auspicious day. The chariots are around 45 feet high which is why the sight of the chariots is most imposing to human eyes. The chariots of the three deities, lord Jagannath, Balaram and Subhadra are Nandighosa, Taladhwaja Devadalana are made out of a specific tree bark while the deities are replaced every 12 years. The return journey or the bahuda jatra always fills the heart with sorrow much like the last day of the Devi Paksh during Durga Puja because that marks the beginning of another year long wait for the gorgeous festivities so this festival is most certainly a must see if you love crowds of happy people out to celebrate. The land of the mystic, India hosts the most sacred fair in the whole world, a fair that has no pair or any remote comparison. It is held every three years in one of the 4 places, Haridwar, Allahabad, Nasik and Ujjain. 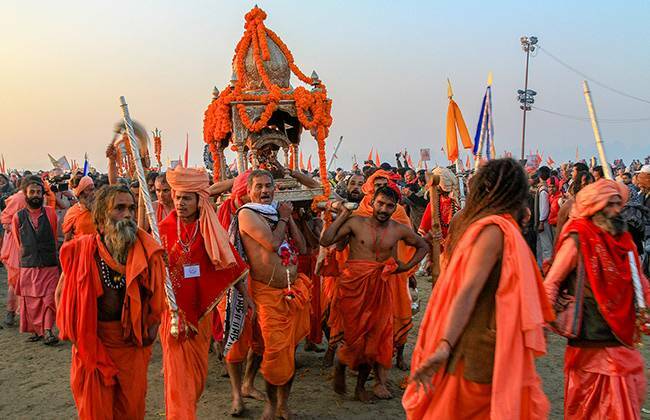 The Ardha Kumbh mela is held every 6 years at 2 places, Hardwar and Allahabad. It is believed that drops of nectar fell in these places during the episode of Samudra Manthan which is why bathing in the river here is supposed to cleanse all sins. This mela is an ancient affair and we do not know when exactly it might have started like nobody can time the birth of traditions in India. India is a land of grand diversities and that extends to various sects of ascetics living here. There are separate akharas made for almost every major sect. Of the 14 at Nasik, 11 belong to Shaiva sects and the rest to Vaishnav sects. The fair is timed in accordance to the arrangement of the constellations. The Leo arrangement is for Nasik, the Aquarius arrangement is for Hardwar, The Taurus and Capricorn combination of Jupiter and Sun is for Allahabad and the Scorpio arrangement is for Ujjain. Millions gather at the fair for a holy dip into the river but no matter who you are, you are holy when you attend the fair because only pilgrims and hermits attend this grand occasion. It is spellbinding to see the staggering number of ascetics who come down from the Himalayas. It is fascinating to see them connect to the Gods and society. They are beautiful in their uniqueness and if you want to witness it all, you must attend the fair at least once. It’s not something you can easily forget. Where: Every third year at one of the four places: Haridwar, Allahabad, Nashik and Ujjain. The world becomes a better place when Devi Durga comes to Kolkata on Mahalaya each year which marks the onset of the most fantabulous festival celebrated in the country. Have you heard of people talking about a city transforming? Kolkata transforms 360 degrees in a matter of days. The city bustles with the puja preparations right since the end of July but the countdown begins from August. It’s natural. After all, the first thing a Kolkatan does on receiving the calendar every year is check the Durga puja dates. It isn’t just the magazines that have special puja editions or popular singers who have albums particularly created for the pujas or market giants customizing ad campaigns exclusively for the pujas, it is about the pandals that make the Durga Pujas in Kolkata simply unparalleled. There are such outstanding presentations even in such modest budgets. The themes, the concepts, the designs and the structures require a stupendous amount of hard work but the end product drowns any sickness your body might be suffering from. The pujas here ideally start from Shaptami or the 7th day of the devi paksh but since good things are always forced to last longer, the celebrations have recenty been pushed to Panchami and now even Tritiya (the third day). Yes, Durga Puja is synonymous to madness in Kolkata. It’s the time of the year when the city forgets to sleep because everybody is ‘Pandal-hopping’. When Dashami comes, there is gloom in every Kolkatan’s heart because a year long wait feels unbearable. Amidst the vibrant ‘Sindur-khela’, the visarjan and the loud entreaties to the Mother to return next year, it’s the heavy heart that binds everybody throughout the city. If you haven’t seen Kolkata during Durga puja, you have missed a great deal so get set go my friends.